Supermicro MCP-290-00001-00 Mounting Rail Kit is optional. Quad Sockets of G34, 1944-pin. Support eight SAS2 ports and RAID 0, 1, & 10. Support six SATA ports and RAID 0, 1, & 10. Support 10BASE-T, 100BASE-TX, and 1000BASE-T with RJ-45 output. One UIO slot, two PCI-e 2.0 x16 slots, two PCI-e 2.0 x8 slots. Serial Port: One Fast UART 16550 serial port, one UART 16550 serial header. Buttons: Power On/Off, System Reset. LEDs: Power, Hard drive, Networking, System Overheat, Power fail LEDs. 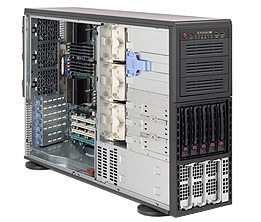 5 x 3.5" drive bays with hot-swap HDD tray, Enterprise SAS2 HDD recommended. - 1200W: 100 ~ 140V, 50 ~ 60Hz, 10.5 ~ 14.7 Amp. - 1400W: 180 ~ 240V, 50 ~ 60Hz, 7.2 ~9.5 Amp.